The 2017 edition of the Université populaire (the People’s University), meeting in Montréal August 17-19, included a panel of speakers from Quebec and English Canada on the possibilities for building a convergence of left forces in both nations. It was chaired and introduced by Andrea Levy, a Montréal-based editor of Canadian Dimension, and included André Frappier, a former president of the Montréal postal workers and now a leader of Québec solidaire; Kevin Skerrett, a leading activist in Solidarity Ottawa; Corvin Russell, a Toronto solidarity activist and recently co-author with Andrea Levy of an excellent paper, “Mapping the Canadian Left: Sovereignty and Solidarity in the 21st Century;”1 and myself. I am a member of both Solidarity Ottawa and Québec solidaire. The Canadian State is a common obstacle faced by progressive forces in Québec and Canada that makes the creation of alliances as much a necessity as a virtue. However, both in Québec and Canada, the left is mired in narrow ideological perspectives and lacking real involvement in day-to-day struggles. The growing resistance of Indigenous peoples is a game changer for both sides as it calls into question the very foundations of the Canadian State. This session proposes to look at how we might build toward a new convergence of forces. – How can the Canadian left support the struggle for national and social emancipation in Québec? – What are the weak points in the Canadian State and among the elites seeking to maintain power. What sorts of struggles can we engage in jointly? – How can progressive organizations in Canada and Québec develop a common strategy of international solidarity with Indigenous peoples in Canada? – What means can we use to fulfill these aims? Levy and Frappier spoke in French, the rest of us in English, with simultaneous interpretation. The panelists’ contributions were followed by some stimulating exchanges with members of the audience. Unfortunately, the session was not recorded. The program introduction speaks of “convergence” as the goal. And it speaks of an impasse between the lefts in Quebec and Canada, implying a divergence. So I’ll begin by exploring this. In what follows I will focus on what can be termed the political left, seeking political solutions to the problems addressed more generally by the various social movements. And I will treat the NDP as a part of the broad “left” in English Canada, for reasons I explain later. Generally speaking, the socialist project is to “change the world by taking power”— that is, building powerful anticapitalist social forces and parties capable of winning control of the state and using government to help build a new anticapitalist popular sovereignty based on decentralized grass-roots participatory democracy. Both lefts can agree that the Canadian state is historically based on the theft and occupation of indigenous lands and the genocide of their peoples; the British Conquest of the French settlers, the defeat of the latters’ Rebellion, and their subsequent marginalization outside of Quebec. The state that resulted, the bulwark of the class rule of the Canadian capitalists, including their Québécois counterparts, is thoroughly integrated within global imperialism. This central state has exclusive jurisdiction over finance, banking, regulation of trade and commerce, issuance of currency, foreign affairs, the military, criminal law, the appointment of judges of the superior courts, etc. The provinces are generally limited to powers of a “merely local or private nature.” And Ottawa holds residual power over all matters not specifically allocated by the Constitution to the provinces, including Quebec. The possession by the surviving indigenous peoples and by the Québécois of the territories in which they predominate, that they partially control and that continue to be the mainstay of their languages and cultures, their respective nationhood, is the basis of their respective quests for political sovereignty. The Canadian state structures and constitution fail to recognize this plurinational composition of Canada, still less the democratic right of First Nations and Québécois to self-determination. The Constitution Act, 1982leaves it to the federal courts to define and interpret the “existing aboriginal and treaty rights of the aboriginal peoples,” while the amending formula (art. 38) effectively rules out the secession of Quebec from Canada in the absence of overwhelming or even unanimous acceptance by federal and provincial lawmakers in the ROC. Quebec’s subordination to the central state structures underpins its oppression—it lacks the powers needed to fully defend its existence as a nation, let alone implement a progressive social agenda. That is why rising social struggles (as in the 2012 Maple Spring upsurge), to the extent that they advance an emancipatory politics, point to the need for national independence. Québécois resistance to their oppression is the major fault line within Canada as a social formation and it is a key source of political and social instability. Apart from some very small political currents that claim adherence to the Marxist legacy, the Anglo-Canadian left for the most part seems baffled by Quebec’s national question. Some may formally claim to respect Quebec’s democratic right to national self-determination, but in practice they are inclined at most to accept or support minor constitutional reforms devised to win Quebec’s acceptance of the Constitution, as we saw in the case of ROC left support to the unsuccessful Meech Lake and Charlottetown accords—the latter rejected by a majority of Québécois in a referendum. The ROC left’s unresponsiveness to Quebec’s national demands deepens its rupture with Quebec progressive opinion. There are important changes taking place within the Quebec national struggle. An historical overview indicates the shifts in class relations it is producing. Following the defeat of the Rebellion of 1837-38 and the British grant of home rule to its four British North American colonies in 1867, thereby cementing Francophone minority status within the new state, the Québécois—led by traditional conservative and clerical élites—fought with uneven success for almost a century in defense of their language and schools and against the denial of their rights in the new provinces created with the expansion westward of the Canadian state. However, in the 1960s, as a result of Quebec’s industrialization and proletarianization by Canadian and foreign capital, a more assertive strategy emerged. The Quiet Revolution, led by Francophone professionals within the traditional capitalist parties and later the Parti Québécois (PQ) but with great popular support, modernized and secularized the Quebec state, and it became the vehicle for expanded education facilities and social programs. Initially, the federal state attempted to accommodate the rising nationalist upsurge, for example through creating the Royal Commission on Bilingualism and Biculturalism or by allowing Quebec to use the massive revenues accumulated by the universal pension plan (the QPP) to help create a new Francophone bourgeoisie, later known as “Quebec Inc.” But as Quebec sought expanded powers through constitutional change, the federalist response became more hostile, culminating in Trudeau Sr.’s 1982 “patriation” of the Constitution with its amending formula and Charter of Rights that imposed limits on Quebec’s Charter of Language Rights and its right of self-determination—later extended through Supreme Court rulings and the Clarity Act. However, federal resistance, while having a chilling effect on the national movement, has not persuaded the Québécois to embrace the federal regime. On the contrary, it has tended over time to deepen Quebec’s alienation from the Canadian state while exposing the PQ’s incapacity to lead the struggle for independence. While seeking an expanded role for itself within the Canadian and global capitalist economy, the Quebec bourgeoisie has never favoured independence. 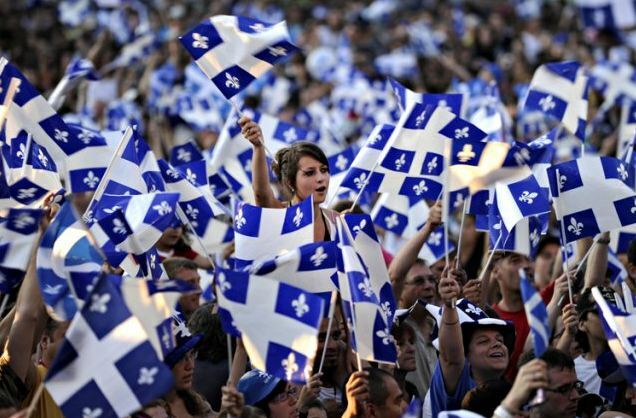 And the Parti québécois, which has hegemonized the pro-sovereignty movement until recently, has always hinged its project—the creation of a state that advances the interests of a Francophone bourgeoisie while retaining popular support through occasional social reforms, workers’ rights and defense of the French language—on maintaining an “association” with the Canadian state through such means as a common currency and even a central bank. The PQ has never been prepared to counter the federalist offensive; it was tamed by the repression in the October 1970 crisis, Ottawa’s signal that it was prepared to use armed force to resist moves toward secession. In this sense, we can speak of the PQ as a “bourgeois” party, a party upholding capitalist rule in all its forms. 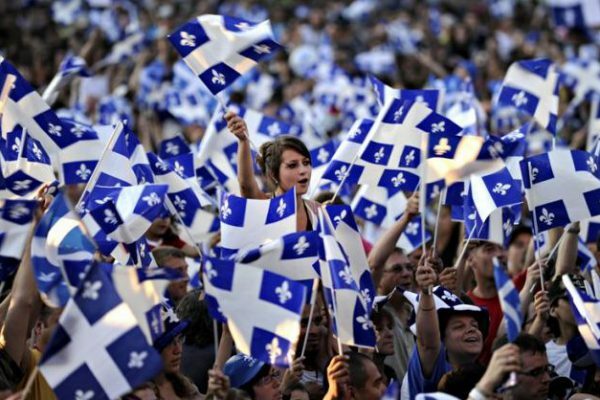 And since 1980, when its first referendum on sovereignty was defeated, the PQ has proved to be another party of neoliberal austerity, now relying increasingly on an appeal to reactionary “identitarian” nationalism that scapegoats ethnic minorities. This is the main cause of declining popular support for the pro-sovereignty movement in recent years. But the Quebec national struggle intersects with the class struggle, giving both a distinctive dynamic and progressive content, and thereby furthering the challenge to the Canadian capitalist state. There is now a recomposition taking place within the national movement with the emergence of Québec solidaire as a progressive (and implicitly anticapitalist) alternative leadership, winning increasing popular support through its role in championing the interests of working people and social movements. This in turn opens new opportunities for advancing the struggle through linking the independence movement with a progressive social program, and vice versa, while pointing to the need for joint action, if not convergence, with left forces in the ROC. The progressive dynamic of the national and class struggles in Quebec, when combined, is illustrated by the program that Québec solidaire is now finalizing. It includes free lifelong education, progressive taxation, the extension of social benefits to precarious workers, expanded rights for temporary foreign workers, environmental protection and meaningful targets for greenhouse gas emissions, as well as a fundamental reorientation of international policy toward achieving global justice and disengaging from the imperialist military alliances NATO and NORAD. QS plans to publish its program (including the recently adopted sections on global solidarity, justice, territory and agriculture) this fall. Containing many progressive proposals, it deserves to be translated into English and promoted in the ROC. What, then, of convergence? My English dictionary defines it as “terminating at the same point.” Are the lefts in Quebec and the ROC likely to do that? And what is that point? Interestingly, the English translation of this panel’s topic asks “How can we bring about a convergence of forces on the left.” But the original French text asks us only to “think about the convergence of the lefts.” I will speak to the latter, because I do not believe a true convergence is feasible in the foreseeable future. I prefer to address the possibilities for joint action around common goals, a united front around the class issues that can unite socialists and social movement activists in both nations and in which the Quebec left, the leading edge, retains its autonomy and its clear national trajectory. Strategically, Quebec independence will only be realizable through massive mobilization and solidarity from working people not only in Quebec but in the rest of the oppressor Canadian state. But first, a few thoughts about the NDP, the hegemonic party in the broad left in Canada outside Quebec, and the prism through which electoral “politics” are largely viewed. It is an established party, with a long history in ROC politics, experience in provincial government, formal links to trade unions and informally with many community, provincial and “national” social movements. Although not anticapitalist, it is seen as the logical alternative to the traditional parties of Capital. Its social-liberalism is seen as a “kinder, gentler” antidote to aggressive neoliberalism. But the BQ is confined to Quebec. In 2011, when it was suffering from the the decline of the PQ and the Harper Tories were threatening to form a majority government, Quebec voters sought a federal option that could more effectively defend them from that danger. The NDP under Jack Layton was able to position itself as the alternative, helped by the apparent tolerance of Quebec self-determination expressed in the party’s Sherbrooke Declaration. The NDP proved unable to sustain that support, especially with Thomas Mulcair as its new leader. Even before his ascendency, the party’s resistance to Quebec nationalism was revealed when it forced leading MPs like Nycole Turmel (the interim leader) and Alexandre Boulerice to drop their QS (and Bloc) memberships. This was a bottom-line issue for the NDP. And since then the party has been unable to sink roots in Quebec. It is barely hanging on to its reduced caucus of 16 MPs, its membership is down to fewer than 5,000 (Le Devoir, Aug. 30), and efforts to build a “provincial” Quebec NDP have gone nowhere. So the Quebec electorate has reverted to its old pattern of voting for what it perceives to be the “lesser evil”—in 2015, the Trudeau Liberals—to the detriment of the NDP. In Quebec the revival of a powerful movement for political independence, combined with relatively strong social movements, can be an incentive for activists to think of achieving their objectives through creation of a sovereign Quebec with a government based on social justice movements. And that in turn can awaken a positive response to Quebec national demands among progressives outside of Quebec. But in the ROC, lacking an adequate political vehicle, social movement activists are less likely to think in terms of socialist-oriented power, the creation of a new kind of state as I have defined it, and more likely to think only of trying to convince governments to adopt progressive reforms. That said, what can be some common campaigns with shared objectives of the broad left in both nations? I’ll mention only two obvious ones—fighting capitalist austerity and fighting for climate justice, especially in opposition to the extractivist economic model—both issues offering important opportunities for forging class alliances with indigenous activists. The key role of the indigenous in leading the fight against climate change, in particular, is signalled in the Leap Manifesto (even though the Manifesto ignores the progressive potential of Quebec independence in posing a real governmental alternative). Like the Québécois, indigenous militants have little reason to limit their demands to what is possible within the context of the existing state. And in Quebec, they have what can be an important ally. The Québec solidaire program acknowledges the sovereignty of “the ten Amerindian peoples and the Inuit people who also inhabit Quebec territory.”4 And QS pledges its support to their “fundamental right” to national self-determination, however they may choose to exercise that right—whether through self-government within a sovereign Quebec or through the political independence of their own communities, which cover almost half of Quebec’s present territory. The Québec solidaire programmatic proposals, both in some particular demands and as a whole, cannot be implemented short of breaking from the federal state and establishing a fully sovereign Quebec. By way of conclusion, I think the ROC left need not support Quebec independence in order to facilitate such alliances, but it does have to understand how the Quebec national question impacts the perspectives for joint campaigns and endeavours with Québécois social movement activists. And I would go further. I think the Canadian left, and indeed consistent democrats, have good reason to go beyond the defense of the right of self-determination and to express solidarity with the demand of most progressives in Quebec for political independence, even if only to help provoke a public rethinking of the undemocratic nature of Canada’s state structures and how they might be reconceived and reconfigured, with or without Quebec, to facilitate the pursuit of a progressive social agenda of equality and solidarity among the constituent peoples within the existing state. This, in my opinion, is a class question, not just national. 1. Published by the Rosa Luxemburg Stiftung, 2017. 3. The Waffle, however, hoped to win Quebec support for its overriding project of building “Canadian independence” from US imperialism, falsely viewed as turning Canada into a dependent semi-colony. 4. Quebec’s indigenous peoples were officially recognized as nations by the National Assembly in the mid-1980s. 5. Emmanuelle Walter, Le Centre du Monde: Une virée en Eeyou Istchee, Baie-James, avec Romeo Saganash (Lux Éditeur, 2016), p. 77. Richard Fidler is an Ottawa activist who blogs at Life on the Left—with a special emphasis on the Quebec national question, indigenous peoples, Latin American solidarity, and the socialist movement and its history.